It was a weird day today. We went to an interview at a private elementary school (we can’t afford), the government reopened and our savings account will soon get relief (at least until this continuing resolution runs out), we went to the funeral of a neighbor who was always incredibly kind to our family (discovered my suit had been eaten to pieces by moths), and I attended As Far As My Fingertips Take Me, presented by Woolly Mammoth Theatre Company, The Laboratory for Global Performance and Politics and The Center for Contemporary Arab Studies at Georgetown University. With the funeral getting scheduled for this afternoon, I debated going to the performance, but limited tickets via a lottery system meant I couldn’t exchange for next week. I didn’t want to eat the money, so I made the trek into the city, dressed in my funeral second-finest, the image of the open casket still quite visible in my brain. The venue had such a different feel from when I was there last. Not a typical performance. No baffled old people shuffling to and from the Box Office. No line for the bathroom. No snacks or drinks being slung. Just one house manager at the door, who after verifying my attendance, gave me brief instructions for the experience. I was to roll up my sleeve, put on a lab coat and large headphones, and stick my naked arm through a hole in the white painted plywood wall. I’ll avoid discussion of the performance itself should you get the chance to go be a part of As Far As My Fingertips Will Take Me before it leaves D.C. 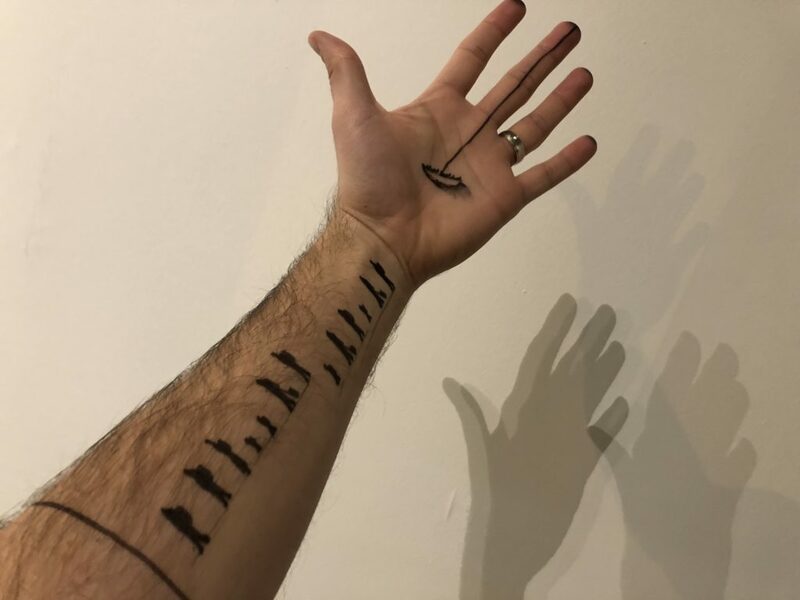 Loosely, broadly, you listen to a story and music of Syrian refugees while the unseen performer draws on your arm. It’s an experience that demands a lot of trust. You’re sitting in Woolly Mammoth’s front window for all the street to see. Someone is gently moving your arm, drawing who-knows-what on there. My body went so still during the performance I later reflected that to passersby, I must have been a mannequin in this performance art department store. It’s a trust honored by the experience, however, as I, someone uncomfortable with physical interaction, never felt exposed (despite, again, being in a window). 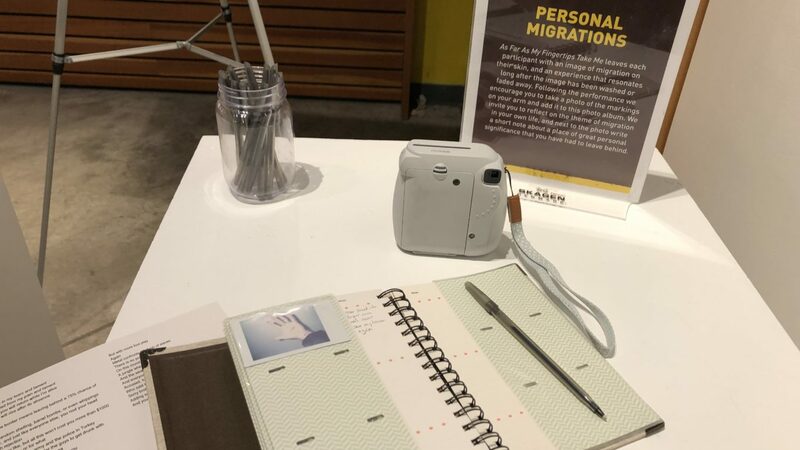 Listening to a journey across borders, arbitrary lines defining who gets to live free while the sensation of my fingerprints being inked was incredibly intimate and considering the day so far, emotionally shattering. With the government shutdown over a vile immigration debate directly affecting my family and dominating our lives and worries for the past month, As Far As My Fingertips Will Take Me puts our minor discomfort into greater context. I’m glad I went despite the rough day. As Far As My Fingertips Will Take Me is by Tania El Khoury and is performed by Basel Zaraa. It plays through February 3, 2019. The website for tickets.